What Does the U.S. Need? NEW YORK (AP) -- A jump in oil prices sent investors rushing to put money into the stock market in the final days of the second quarter. Here is the FOR case. TIPS are the only long-term U.S. government debt to post gains in what is the worst year for U.S. securities since at least 1978. TIPS have returned 2.98 percent since December, including reinvested interest, while Merrill Lynch & Co.’s U.S. Treasury Master index slumped 5.7 percent. Here is the AGAINST case. As usual, I am right in the middle. That's much like I am in the inflation vs. deflation debate overall. That being said, I have almost my entire nest egg in TIPS. 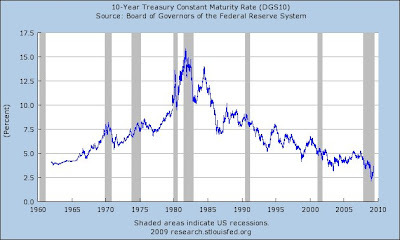 I'm a believer in the long-term bull market in "safer" havens, and there's really nothing much safer than US Government backed debt that's also inflation protected. Note that I didn't say it was safe. I'm just saying it is safer. Let's look back nine years. That's when the bull market in safer havens began. Considering how much pain has been inflicted in both the stock market (twice!) and the housing market (once! ), there really hasn't been a whole lot of deflation so far. We're looking at $70 oil even during one of the biggest downturns this country has ever faced. I am sympathetic to the deflationist arguments though. Don't get me wrong. I could easily see the price of oil drop by half. It would still be more expensive than it was in 2000 though. 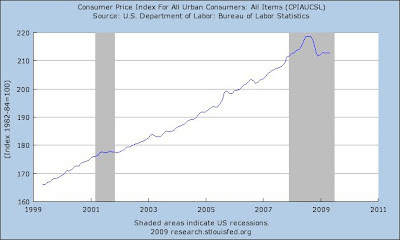 As seen in the chart, the CPI ended at roughly the same point it started during the 2001 recession. It flat-lined. Note that while volatile, the CPI is also at roughly the same point it started during this current recession. That's not exactly the sort of deflation that the deflationists would point to as an overwhelming confirmation of their theories, at least so far. Here's why I think TIPS is much better than buried cash, even if the deflationists seem right. It's certainly possible. 1. No matter how bad deflation gets, if we buy TIPS we still get the face value at maturity. If we buy $1000 worth of 10-Year TIPS during the next auction and hold the full 10 years then we are guaranteed to get at least $1000 in 10 years. That is absolutely no different than burying cash in our backyards for 10 years. 2. Unlike buried cash, TIPS pay interest. Therefore, if we are a believer in the long-term bull market in "safer" havens and we are absolutely convinced massive deflation will be upon us, then TIPS is still a better long-term play than buried cash. 3. What if we are wrong about deflation? What if we enter a stagflationary nightmare instead? That buried cash would be dug up so fast it would make our heads spin. What might we buy with it? I don't know. Maybe something with inflation protection that's reasonably safe. Perhaps TIPS. Of course, if we are digging up our cash to buy inflation protection at that time, chances are we won't be first. That means it will cost us more. 4. Some might argue that cash is safer than TIPS because the government might not pay us the interest it owes us and will quite possibly default on the principal too. I'm not in that camp. We would be owed little pieces of faith based paper (dollars). That's it. Ben Bernanke has a monetary printing press that can print them at "essentially no cost". We'd need brave politicians to explain to us why the government can't print us what it owes us at essentially no cost. There is no promise that the pieces of paper will be worth anything of course. The less they are worth, the easier it will be to print them. And lastly, just exactly where will we find these mythical brave politicians? I sure haven't seen many. So yeah, I like TIPS. Deflation? Inflation? Stagflation? Whatever! If I am wrong to like them, then the "riskier" havens are going to be absolutely devastated. There's very little I can do to protect myself in that world though, so why even bother trying? This isn't investment advice of course. It's just the rantings of what would best be described as a permabear I guess. We find ourselves in a hole (debts and deficits) we can't quite get out of. Our solution? Dig deeper. This just makes me sad. I could not read all of the following article without cringing nor could I read even a fraction of the 324 comments. I’m an academic advisor in natural sciences at a 4-year state school; day after weary day I advise students with below average grades who have unrealistic expectations and cannot accept the fact that — contrary to what they’ve been told all of their lives — they cannot be a scientist or doctor. These are heartbreaking stories. I knew from common sense that student debt was undesirable, but reading these comment threads has convinced me that we are in a horrific situation as far as our young (and some not-so-young) people are concerned. WASHINGTON - Bolstering education and training — rather than erecting trade barriers — would help narrow the economic gap between low- and high-income workers, Federal Reserve Chairman Ben Bernanke said Tuesday. 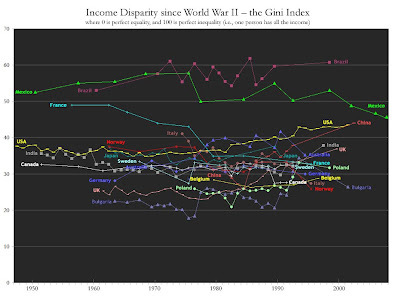 How is more education going to help close the gap? I'd really like someone to explain that to me. Americans have embraced higher education over the last few decades in a major way. Has the gap narrowed? No. Note the yellow line in the following chart. I'd also like someone to explain to me how taking on massive debt helps close the net worth gap, because I'm fairly confident that one is even further out of whack. And lastly, here's a look at Tomorrow's Jobs. That's an additional 4.3 million jobs (in theory). A general college degree is not useful for most of the jobs, and mostly insufficient for the rest of them. I started this post with the idea that this makes me sad. I guess I'll end on that note too. WASHINGTON (Reuters) - A judicial body is urging Congress to authorize new bankruptcy judgeships to cope with a surge in bankruptcy filings that has tracked weakness in the U.S. economy. Well, there you have it. I knew we needed something. Andy Xie's thoughts often closely match that of my own. We've had another sighting over at Naked Capitalism. Must read! Guest Post: Andy Xie - "Markets Are Trading On Imagination"
Here's a quote to wet your appetite, but the entire article is well worth a read. Rising oil prices, though, lead to inflation and depress growth. It is a stagflation factor. If the Fed doesn't rein in weak dollar expectations, stagflation will arrive sooner than I previously expected. Here's a previous link that's a modest summary of his previous predictions. NEW YORK (Dow Jones)--Wealth managers are seeing increased interest from charities and private foundations that, hit by endowment declines and shaken by prominent fraud cases, are seeking more professional help with investment decisions and due diligence. I'm fairly sure our government is bailing out the "professional help" as we speak. It seems the professionals came up somewhat lacking in toxic asset risk management and toxic asset due diligence. Other than that, I'm sure the professionals provide great wealth management in general though, lol. UBS, the world's largest wealth fund manager, saw an outflow of $95billion as clients left because of the bank's exposure to toxic assets and its spat with the US government over offshore accounts it set up for American citizens. Let's summarize. Wealth managers are seeing renewed interest by those who have not used wealth managers in the past. Meanwhile, existing clients of wealth managers are leaving in droves. Doesn't that just figure? How Do I Know You're Not Bernie Madoff? Still, this is the ultimate reverberation from the Madoff scandal: trust, the foundation between wealth manager and client, has been called into question, if not destroyed. Here's a crazy thought. Be your own wealth manager. You certainly couldn't do much worse. Even if you lost it all, at least you'd have the satisfaction of knowing you didn't pay yourself excessive wealth management fees for the privilege. So why is it that we believe the lies? Mr Pandit has pledged to turn around Citigroup's fortunes. "Something went wrong over the last few years"
Something went wrong over the last few years? Sage wisdom from the man who ought to know. I now present you with the musical genius of yet another Pandit. Oh yes! 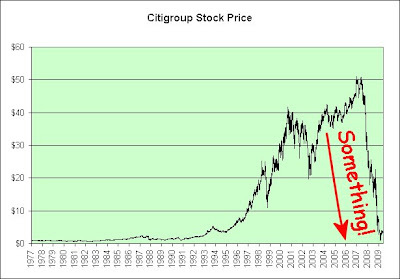 I can feel Citigroup's stock price healing as we speak. Look into Pandit's eyes and let Miserlou consume you! Thanks to Kevin for inspiring the post. HONG KONG — Strong buying by China has helped lift commodity prices around the world this spring, but growing evidence suggests that a sizable portion of this buying has been to build stockpiles in China, and may not be sustainable. Some economists say they are bullish on commodities because they believe that the United States and European economies are on their way to recovery. Q: After losing a fortune on stocks I moved my money into a savings account. Now, I'm losing ground again as interest rates fall and stocks recover. Should I dip back into stocks of big, stable companies? Stocks slid Monday following steep drops in Europe and Asia as a stronger dollar pushed commodities and materials prices sharply lower. The market was also disappointed that an index of manufacturing in New York indicated that demand weakened in June from May. From now on, when you take a [blue] chip, just take one dip and end it. First, I'm borrowing MaxedOutMama's negflation term. In order to have a redux, we must first find the dux. Therefore, let's go back in time. He was right. We were already in stagflation. "We are facing a situation where we have simultaneously a slowdown in the economy, stress in financial markets, and inflation pressures coming from these commodity prices abroad," Bernanke said. That's stagflation. You cannot fall into something you have already fallen into. So what did he anticipate happening next? "At the moment, I think the greater risks are to the downside, that is to growth and to financial markets," Bernanke said." Score one for the Fed Chairman. He saw the Great Negflation coming. Well, I think it is safe to say that we've found the dux. So where's the redux? 'In future, China is likely to see periods of stagflation, with CPI (consumer price index) rising above the long-term average level ahead of GDP,' said the centre, part of the National Development and Reform Commission, the country's top economic planner. Silly China. We've already seen this once. If oil keeps rising, the entire global economy is going to crash again. After writing this much it dawned on me to do a full search of the Internet for the word negflation to see what else appeared. There were a total of five occurrences. That surprised me a bit. I expected more. Two were on MaxedOutMama's blog, one was on my blog, one had nothing to do with the economy at all, but the last one was just plain spooky. It comes from the comment section of the following article. Bernanke: "I Don't Anticipate Stagflation"
Bernanke has no credibility left. We are already in stagflation. The problem coming is not low growth with inflation however, it is negative growth with inflation. Imagine my surpise! Bernanke again! I wonder if mmckinl had any idea just how negflationary things would soon get? Sorry Ben Bernanke. Negflation somehow seems linked to you. You wanted the job as Fed Chairman. Remember? I guess it was a pretty easy decision back then though. With "no housing bubble to go bust", who wouldn't want the job? Today's USA Today has a full page advertisement that offers a free safe if you buy 267 never-circulated U.S. Government coins and currency. 1. A free safe! Woohoo! Is it a good deal? Let's start with the safe. Free safe! Awesome deal! Enough said! Now let's move to the presidential dollar coins. Probably best to just stick with the melt value of all that gold. Right? $0.0395132 is the melt value for the 2007-2009 Presidential golden dollar on June 04, 2009. Oops! The one dollar face value was clearly the better way to look at it. Maybe we can make it up on ALL those nickels though. First, let's find out how many were minted. There were 936 million coins minted. Ouch. What about metal content? As of December 14, 2006, the value of the metal in a United States nickel coin reached $0.055759, an 11.5% premium over its face value. Fantastic! We're going to be rich once we melt them. In an attempt to avoid losing large quantities of circulating nickels to melting, the United States Mint introduced new interim rules on December 14, 2006 criminalizing the melting and export of cents and nickels. Violators of these rules can be punished with a fine of up to $10,000, five years imprisonment, or both. Bummer! How about those $2 bills? The most significant evidence of the $2 bill's reawakening would be that, in 2005 alone, 61 million $2 bills were printed by the U.S. Bureau of Engraving and Printing. This is more than twice the number of $2 bills that were printed annually between 1990 and 2001. People love hoarding $2 bills. I'd say they are worth about $2 though. Just a hunch. As a side note, people are strange. That leaves us with the one American Eagle Silver dollar. It's tough to put a price on just one unless you are buying through a full page advertisement in a national newspaper. Here's an attempt though. In summary, we get 12 dollars worth about a dollar each, 250 nickels worth about a nickel each, 4 two-dollar bills worth about two dollars each, one silver dollar worth about $16.90, and a "free" safe. Before I explain the extreme danger we are in, I wish to offer two of my favorite quotes. So, that being said, imagine what I think when I read the following quote. That's our job and the purpose for this book, to re-innovate and by understanding not just how to innovate products and services but how to innovate innovation itself. What the heck is innovate doing in there four times, two of which are back to back? It isn't just that sentence though. I'd encourage you to read the entire article. It's not long. It's an innovate, re-innovate, innovating, and innovation extravaganza. By my count those words are mentioned over 50 times! Keep in mind this is just one small excerpt from his book, lol. Just how messed up are we? It's taking a fun environment with creativity and fun to a whole new level. It's a level I never thought possible. Don't answer. I already know. We're seriously messed up. Here's one more quote from the article. We are surrounded by more useless inventions than at any other time in history. Affluence seems measured by the number of things we can accumulate and then drag to the trash bin. I hear that. We have an innovative environment with creativity and innovation no doubt. If we can simply translate the overwhelming successes of financial innovation into every other aspect of our lives, we'll all be eating cat food from the comfort of our cardboard boxes in no time. the contrarian - Are We Looking At Hyper-Stagflation? If ever the stage was set for inflation, then, this would seem to be the time. However - and here's the rub - having been an economy watcher for longer than I care to admit, I've never seen the so-called body of conventional wisdom correctly call a significant turn in economic conditions. It's had a decent track record in prognosticating a continuation of already existing conditions. But, as for nailing the timing of changes in the general direction of major trends, it's been an utter failure. He makes a very good point. I think that if oil continues to rise, we're going to have yet another deflationary crash. The stock market is certainly primed for it. It's had an amazing run. What if, instead of runaway, or hyper inflation, we enter a period in which the forces of deflation and inflation seem to offset each other? In such an environment, we might see prices continue to increase for a time until the negative impact on the consumer causes the economy to contract once again. Then, as soon as it appears that a floor is being laid to the new downturn, prices once again begin to soar. And this relatively rapid and concentrated up/down trend continues, negating the possibility of a return to what we might call normal conditions. Behold Greenspan's Age of Turbulence. Greenspan ought to know. He helped create most of it. This theory allows the market to inflict maximum pain on the most participants. Any fixed investment style stagnates, much like any fixed gambling style stagnates within a casino. The stock market investors made a lot of money when the stock market skyrocketed. They then lost a lot of money when the stock market crashed. The commodity investors made a lot of money when commodities skyrocketed. They then lost a lot of money when commodities crashed. The housing investors made a lot of money when housing skyrocketed. They then lost a lot of money when housing crashed. The long-term bond holders made a lot of money when interest rates fell. They then lost a lot of money when interest rates rose. Why do we do it? The government wants us in the casino. CNBC wants us in the casino too. Think Fast Money! Think Mad Money! Meanwhile, the casino continues to take its cut every time we make a bet. That allows the government to take a cut every time we win. Further, the casino is actually allowed to gamble against us and somehow we are all okay with it. Go figure. Why Does Goldman Sachs Need 10 Acres of Trading Floor? In the case of the new Goldman Sachs headquarters, we're talking about multiple huge floors: six, to be precise, each one 72,000 square feet. That's 432,000 square feet in all, or roughly 10 acres. If I was playing poker and saw that my opponents were using 432,000 square feet of office space with the sole purpose of helping them win the game, I'd be very inclined to walk away. In fact, I do walk away. Day trading is not something I'm even remotely interested in. My idea of a gambling thrill is to buy the 10 year TIPS directly from the government and hold it until maturity. Warren Buffett once said that inflation is like a tapeworm. In my opinion, there's more than one tapeworm in our society though. Thanks to increasing leverage (debt) in the system, it takes smaller and smaller rises in interest rates to force a recession. Let's assume that "toxic assets" require an interest rate environment that continually decays, so as not to cause a financial meltdown and extreme deflationary fallout. What might a chart of that look like? Glad you asked! You know, that's a pretty darned good fit if I say so myself. This model approaches 0% interest rates. It takes an infinite amount of time to actually reach 0% though. This is really good news. 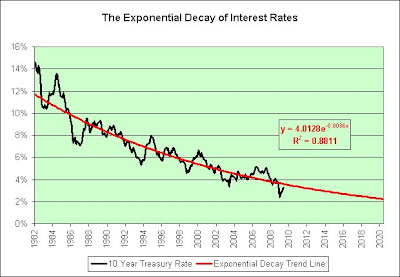 At 0% interest rates, we would be able to take on infinite debt. Just look at Japan's attempts. That seems to be our current plan too. Fortunately, this model seems 100% sustainable well into the distant future. Oh happy days! So what might go wrong? What external factor could cause a containment breach and leak our "toxic assets" out into the real world? "If current oil prices move up very fast in a spike, then it could have an impact on economic recovery," IEA head Nobuo Tanaka said Monday. Oh oh. Once more unto the breach, dear friends, once more. You know what? I think I'll remain bearish if you don't mind. This post inspired by Kevin.